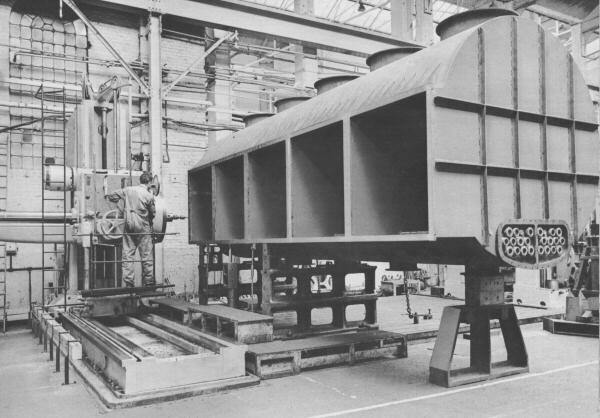 In the late 1950s and early 1960s Paxman's Boiler & General Engineering Division (which became the Boiler & Industrial Plant Division in about 1960) worked on the development of desalination plants designed to produce fresh water from sea water. The Company had great hopes for this venture. It believed there was a very large and profitable market for such plants, particularly in places like the Gulf states of the Middle East. It was recognised that success in this field would depend on developing plants that were both economical in operation and capable to producing large quantities of fresh water on a regular basis. Another potential market identified was the marine one, where waste heat from the water jackets of ships' diesel engines could be used to produce a supply of fresh water. The idea of building and selling desalination plants was part of Geoffrey Bone's strategy to expand Paxman's product range. Geoffrey Bone, an enthusiastic and forward-looking engineer, had joined the Company as Chief Experimental Engineer in 1945 and been appointed Managing Director in 1954. Open to new ideas, he was always on the lookout for potential new markets. Work on desalination plant was under the direction of Dr David Allen-Williams, Head of Paxman's Research Department. It would appear that while Dr Allen-Williams was ultimately responsible for the experimental work, he had little personal involvement in it. Only a handful of people seems to have actually worked on the project. Someone mentioned by two or three people as having been closely involved in Paxman's work on desalination plants was Paul McKellar. Sources of information about Paxman's work on these plants are, unfortunately, now very limited. Not entirely surprising as the work was undertaken about fifty years ago and most of those closely engaged on it are no longer around to help with their recollections. Furthermore, the desalination plant venture was relatively short-lived, perhaps spanning five or six years, and ultimately failing to take off. As far as we are aware only two plants were built, both experimental. There is no evidence of any having been built for sale. If anyone can add to the information on this page, it would be much appreciated if they could please contact me with details. Four references to desalination plants have been found in old publicity literature. In a 1961 brochure advertising Paxman's welding and fabrication facilities is the picture shown below of the main body of a 40,000 gallons per day desalination plant. (1) This is believed, but not yet confirmed, to be one working on the vapour compression principle. Then there is a four-page Paxman brochure on Flash Evaporators (2), a couple of paragraphs in a small introductory guide to the Company entitled Colchester and Paxman (3) , and a small Ruston Group publicity booklet (4), which has a page devoted to Paxman sea water distillation plants. Drilling operations on the fabricated main body of a 40,000 gallons per day sea water distillation plant. 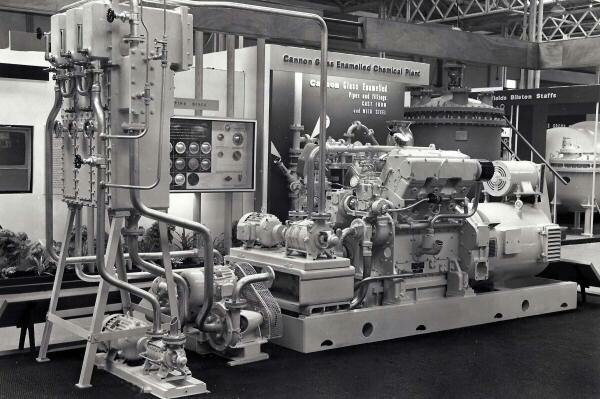 on the Ruston Paxman Group stand at the 1962 Chemical & Petroleum Exhibition. Paxman conducted trials with two different desalination technologies: vapour compression and flash evaporation. At the time of the trials both technologies were well known and employed in plants offered by other manufacturers. It is clear that during its development work on desalination plants, Paxman encountered substantial technical problems which it was unable to fully overcome. Failure to find satisfactory solutions to these problems is the most likely explanation for the eventual abandonment of the project. Cliff Hudson was involved in the early stages of Paxman's work on desalination plant during his time with the Company from about 1958 to 1960/61. He clearly recalls working on an experimental plant, located at Standard Works, which operated on the vapour compression principle; flash evaporation was not being considered at that stage. Cliff Hudson reported to Dr Allen-Williams and used the experimental plant while investigating the matter of scale formation. This was an essential issue to be satisfactorily resolved if a desalination plant was to be successful. A supply of sea water was required for the experimental work. Nearly every day, for two or three months or more, lorries were sent down to The Strood, the causeway over to Mersea Island, at high tide, where drums were filled with sea water to be brought back to the Works. (5) Confirmation of this activity was received during a chance meeting in July 2011 with two retired Paxman men who recalled the lorries returning to the Works, through Standard Road gate, with their drums of sea water. Subsequently trials were conducted with a vapour compression plant located at or near Harwich, on the coast, about sixteen miles east of Colchester. Brian Francis recalls that this used a 12 cylinder Paxman YH engine, driving a compressor. He says there was a major problem, never satisfactorily resolved, trying to maintain the required temperature balance. Alec Burwood, who worked in the Boiler Division at the time, remembers colleagues going off site to work on this plant. They suffered a certain amount of leg-pulling, being ribbed about going on trips to the seaside. Alec recalls the day when colleagues returned to Colchester with the day's production of 'fresh water' from the plant; only about half a bottle. In the office he took part in a tasting of this sample and says it tasted terrible. (6) After a few years of unsuccessful trials the plans to manufacture desalination plants were quietly dropped. It utilizes waste heat from diesel jacket cooling water which is normally discharged overboard. Formation of scale is negligible since no boiling takes place on the heating surfaces; this results from a limitation of the sea water temperature to 63 deg. C. (145 deg. F.) and no increase in its concentration as it passes over the heating surfaces. It is automatic in operation, subject, of course, to the functioning of the pumps, and will absorb fluctuations of heat input and sea water flow by self-adjustment of vacuum and output. Its operation is unchanged by these fluctuations, whereas a coil-type plant would invariably prime under similar conditions. 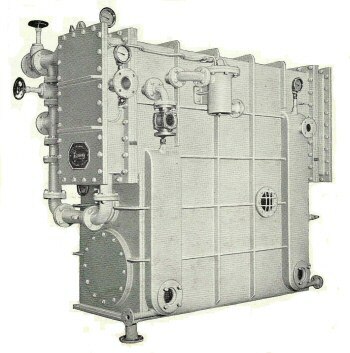 The diagrammatic layout below shows a Flash Evaporator unit using, as its source of heat, jacket cooling water from a ship's main engine. Sea water is passed firstly through a condenser where it accumulates heat in condensing flash vapour. It is then fed through the tubes of a feed heater where its temperature is further increased by diesel jacket cooling water, at approximately 66 deg. C. (150 deg. F.), flowing on the outside of the tubes. After leaving the heater, the sea water enters a flash chamber via a number of orifices, their area being such that the sea water on the up-stream side of the orifices is maintained at approximately atmospheric pressure. This condition ensures that no boiling takes place in the heater. A vacuum is maintained in the flash chamber, and a proportion of the sea water, after passing through the orifices, flashes into vapour. This occurs because of the temperature difference between the entering sea water and the vacuum in the flash chamber. The vapour released passes through a vapour separator and then to the condenser where it is condensed to form distillate which, in turn, flows to a distillate pump and thence to the ship's tanks. The unevaporated sea water (now termed brine as it is slightly concentrated) which remains after flashing has taken place, flows to the brine pump and is discharged overboard. From the foregoing it will be seen that the unit is fitted with three pumps, the brine, distillate and vacuum pumps. A sea water pump can also be supplied if required, but it has been found that normally the sea water requirements can be taken from an existing main. As the brine and distillate pumps extract their respective services from a chamber operating under vacuum, in order to keep the cost of these pumps low, they are fitted on a lower deck level than the main unit. This gives a normal positive suction head on the pumps of approximately 12 feet, which partially counteracts the adverse suction conditions imposed by the vacuum. The vacuum pump is fitted adjacent to and on the same level as the main unit. All pumps are coupled to totally enclosed tropicalised motors. Control valves and a Dump valve. Although these plants are designed to use, as their heat source, diesel jacket cooling water which is normally discharged to waste, they can also be operated on low pressure steam if this is more readily available. When required, a steam operated ejector can be fitted in lieu of a vacuum pump. I.F.M.10 10 7' 6" 3' 6" 5' 0" 6' 3" 4' 6"
I.F.M.20 20 7' 6" 4' 0" 6' 0" 7' 3" 4' 6"
I.F.M.30 30 8' 6" 4' 6" 7' 0" 8' 3" 5' 6"
Note: The dimensions quoted above are approximate only and are subject to confirmation. Tube withdrawal can be arranged to right or left as required. Units are available for any large output required. Particulars will be furnished on request. DAVEY, PAXMAN & CO. LTD.
To meet the demand for potable water in remote areas, Paxman's have recently introduced a series of skid-mounted distillation plants which are powered by Paxman RPH engines, and produce fresh water from raw sea water. The plants are fully automatic in action and are designed for outputs of from 40,000 gallons upwards per 24 hour day. They are entirely self-contained, control of scale formation on the heat-exchanger surfaces being achieved by a patented process which avoids the need for chemical dosing of the feed. Paxmans also design and manufacture a complete range of Flash Distillation Plant. These units, when used in conjunction with diesel engines or gas turbines, offer the user a combined output of fresh water and power, thus employing a very large proportion of the heat contained in the fuel consumed by the engine. Designs are also available for use with steam or other direct heat sources. The availability of Paxman desalination plants, operating either on the flash evaporation or on the vapour compression principle, is advertised in the Ruston Group publicity booklet referred to earlier. The text of page 76 is reproduced below. The lower half of page 76 has a picture of a '50,000 g.p.d. sea water distillation plant'. It seems extremely doubtful that Paxman ever built such a plant and the suspicion must be that the picture was a 'mock up' not a photograph of an actual plant. As mentioned previously, there is no evidence of either a production flash evaporation or a production vapour compression plant being built by the Company. Plants for land operation working on the flash evaporation principle are available with outputs from 2,000 to 50,000 gals. per day, or larger to suit special requirements. These plants can either be self-contained or utilise the waste heat from diesel engines, gas turbines and natural gas. A range of smaller plants are also available for marine use with outputs ranging from 10 to 30 gals. per day. The water from these plants is potable except in some instances where the raw water may be heavily contaminated and in these cases purification equipment can be supplied. The Thermodyne Distillation Plant is a self-contained skid mounted installation for producing potable water from sea water. The principle on which the plant operates renders purification unnecessary irrespective of the raw water condition. The plant operates on the vapour compression principle and the cost of operation is less than that of a modern multi-flash installation. The Thermodyne is therefore particularly suitable when waste heat or abundant cheap power are not available. The standard plant has an output of 50,000 imperial gallons per day. 1. Welding and Fabrication for World Industry , Paxman Publication No. 1696, February 1961, page 7. 2. Paxman Flash Evaporator , Paxman Publication No. 1701(R), June 1962. 3. Colchester and Paxman , Paxman Publication No. 1335 (3rd Revision), April 1961, page 31. 4. Ruston Group - Ruston Paxman Wiseman , Ruston Publication No. 8776 (11th Revision), June 1963, page 76. 5. As recounted to me by Mr Hudson on 25th August 2011. 6. Telephone discussion with Alec Burwood on 4th July 2011.